Audio conferencing requires the use of an audio device. 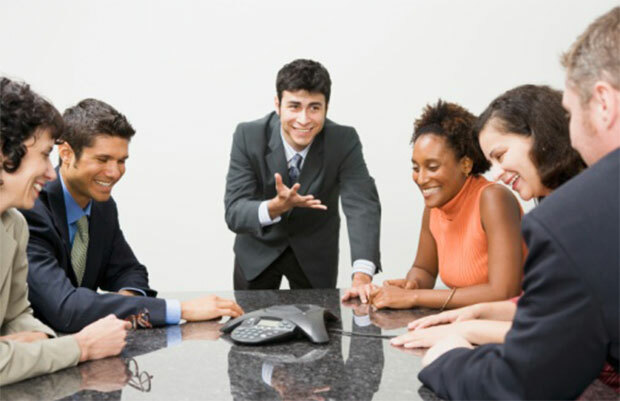 Audio conferencing aims to link two or more people together through telephone or mobile communication. Conference calls are popular amongst businesses globally. One can arrange an audio conference to brief staff on a project or discuss a business proposal. Compared to a face to face meeting it is cost effective and can be organized quite easily. The use of a PC can be integrated into the call set up. To subscribe to an audio conferencing service one can sign up online. One has to create a new account on the sign up page or join an existing company account. The benefits of audio conferencing are numerous. It increases productivity as one is free to use the time spent travelling to the meeting to continue working on projects. If one wants a quick decision or approval for an idea one can get quick feedback from colleagues. The meeting is secure. The platform one is using is a “virtual meeting space” and there is a “conference lock” application which stops outsiders entering the virtual space. The popular audio conference services offer 24/7 operator assistance if one needs help technically. Online one will find educational resources to help one understand the system one is using. Calls within an audio conferencing context can be recorded for your reference and also the web based interface allows one to control and monitor the call. Free storage space for audio files is offered usually. The billing for this service is online. There are two main services one can use. Self managed services and managed services. Self managed services can accommodate up to 40 participants per session. The service offers a local number to dial in which is good for a global business meeting. Participants can share information during the call/ presentation easily through visual slides and documents, putting forward ideas clearly. Audio conference service providers might offer a free trial for 30 days before you sign up to use the service. You can test all the features that the system has familiarizing oneself with useful features for calling and managing the call online. Most call audio plans are flexible. One does not have to make a reservation in advance to set up a audio conference call. The call can be arranged by the user 24/7. You can also get a copy of the call report sent to your email outlining specific details at no further cost. In today’s business world meetings are scheduled quite frequently as critical processes and decisions have to be discussed and practical action has to be taken. To have a dedicated reliable audio conferencing service that one can use is ideal. The costs associated with this service are reasonable overall. With the useful controls that are inbuilt one has the freedom to explore how to manage the call, what works efficiently for one’s purpose. An audio conferencing provider such as StartMeetingsm gets the opportunity to work with many business organizations globally and the system is developed for the business owner.